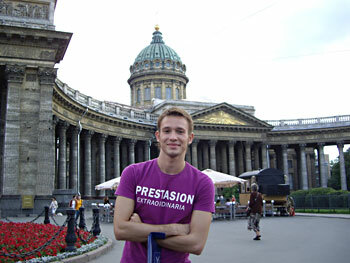 Gay tours in St. Petersburg Russia. City tour. All about Saint-Petersburg. St. Petersburg is the second largest city of Russia with the population of about 4,5 million people. The city is not very old. In fact, it’s the youngest capital in Europe. It was founded by Peter the Great on the 27th of May in 1703. This day is considered to be the city birthday. The city was called St. Petersburg. It was named after Saint Peter who was a patron saint of Peter the Great. In 1914 the city was renamed Petrograd because of the First World War in which Russia fought against Germany. The word “Petrograd” is a mere translation of the previous name of German origin into Russian. After Lenin’s death in 1924 the city was renamed Leningrad and in 1991 after the referendum its original name was restored. For more than two centuries St. Petersburg was the capital of Russia. The capital was transferred to Moscow in 1918 (as St. Petersburg became a dangerous place for the government because of the Civil War). Everybody knows about the siege of Leningrad during the Second World War. It lasted for 900 days and the city lost every third resident and one third of its living space. After the War, the city has more than doubled. There are a lot of new housing developments in St. Petersburg. At present the city occupies the area of over 600 square kilometers and is famous for its architecture and numerous museums. The city is built to one design, to one principle of building which can well be seen if you fly over it in a helicopter. In fact, the city is unique because there are very few cities in the world, which are built to a single architectural design. The UNESCO has designated St. Petersburg as a city-museum. St. Petersburg is situated in the delta of the Neva River. In Peter the Great’s time, there were 100 islands here. Now the city is located on 42 islands as some rivers and canals were filled in. There are over 350 bridges in the city. Now the city is crisscrossed by 68 rivers and canals, and not without reason St. Petersburg is often called Northern Venice. is the largest of the 42 islands on which the city is situated. The focal point of the Spit of Basil’s Island is the building of light gray colour with numerous white columns, reminding of a Greek temple. This is a former Stock Exchange Building, designed in the early 19th century by Thomas de Thomon. On the pediment there is a sculptural group of Neptune Emerging from the Waves and a representation of the Neva (with a crown on the head) and the river Volkhov on the one side, and Mercury, the God of trade on the other side. Now the building accommodates the Naval Museum. It is one of the oldest museums of this country. It was founded by Peter I in 1709. On display are the models of ships made in Russia. was designed in 1823 by the architect Zakharov at the site of the shipyard of Peter the Great. The building has a shape of a Latin letter “U”. The central block is surmounted with a gilded spire. 2 wings of the Admiralty can be seen from the riverside. They are decorated with the anchors taken from the ships of Peter’s fleet. Now the Admiralty is a Nnaval Academy. Facade is decorated with 56 large sculpture, 11 large relieves, 3 moldings executed by Pimenov. The subject is of the Glory of the Russian Navy. The highest relief over the arch is dedicated to the foundation of the Russian Navy by Peter I. It shows Neptune with a trident presenting to Peter the Great. Besides the Tzar is the Goddess Minerva, who is looking at Russia, represented a little girl seated under a Loral tree. Russia is lining on a club of Hercules and stretching out a horn of plenty to Mercury. On either side of the main entrance there are monumental groups of sea nymphs supporting Globs. Each group symbolizes the mythological Goddess, who is in her three shapes- water, sky, Earth. It’s one of the symbols of S-Pb. During the siege the spire was camouflaged but the building seriously suffered during last War. 3 bombs and 58 shells hit it. The Catherine Palace is a former summer residence of Russian Emperors. In the beginning of the 18th century Peter the Great gave this land to his wife Catherine the 1st. 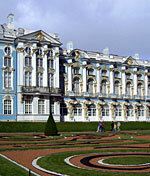 And the 1st Catherine Palace was built for her as her private residence. In the middle of the 18th century her daughter Elizabeth made it her official summer residence, which was named Tsarskoe Selo which means “Czar’s village”.